jj: All right, we're recording. Okay, please state your whole name and where we are. Leah? lw: Leah Wiley, and we are at Jamie Janofski's home on Lincoln Boulevard in Marion, Indiana. jj: Okay, and the date today? lw: This is March the 31, 1998.
jj: Okay. Do I have permission to tape you with audio tape? jj: Okay. And can I submit this information to Marion High School? jj: And also to the Marion Public Library? jj: Phil, do I have permission to tape you with an audio tape? jj: And to submit, um, this information to Marion High School and Marion, Indiana Public Library? jj: Okay, we're ready to begin. All right, we're going to do this in about three sections, basically: before World War II, during World War II, and after World War II. jj: The first question I have is during the 1940s what age group were you in? pw: I was, uh, nineteen. lw: I was in my twenties. jj: All right. Where did you live in Marion? lw: I lived on West First Street. pw: I lived on West Second, Second and "F". jj: All right. Um, before World War II what family did you live with? lw: I roomed with some other girls on West First Street. jj: Okay, all right (in background). pw: I lived with my mother. jj: Okay. What was a typical day like in your family or with the people you lived with in the 1940s? Leah? lw: I, uh, worked at the First National Bank in Marion and um, before the war, and just generally had a good time and worked and that was pretty much it. pw: I was a machinist, tool and die making, in training from tool and die making at Wiley and Lett, First and Boots. jj: All right. Um, so you worked at a bank and you, you worked at a machine place. pw: Before I was in the service, yeah. jj: Right. Okay, can you describe a typical family gathering to me? Or any special memories that you have? lw: My parents did not live in Marion so I didn't have family gatherings other than I had a brother up around in, uh, Santa Fe, Indiana, and I would go up there for family dinners and this type thing. pw: We did that even after we were married. Um, up at, uh, Stargill, Ohio at her brother, but, um, my mother worked. She was night supervisor at the hospital. She worked twelve hours each night and, uh, there was five of us, five boys and one girl but, uh, we didn't have too much in the way of family gatherings or anything, Mother working all the time. jj: Okay. What were your hobbies during this time? lw: A little earlier I used to roller-skate at Idyl Wyld Roller Rink. I was at Idyl Wyld Roller Rink the day it opened. I skated for oh, well, quite a lot. That was pretty much, I guess, the recreation around that time. Then we use to go, then um, we used go to the show a lot. jj: So, is that the movie theaters? pw: I used to play a lot of ball. Soft ball, hard ball, and, and a lot of bowling, a lot of bowling. jj: Did you play for, for the school? Or just on your own? jj: That's fun. Um, with whom did you spend most of your time? With friends or family? pw: Max Morgan and I were good friends, and, uh, we used to be together an awful lot. lw: I lived with another girl, and, uh, we used to skate. And, um, I think that was pretty much it for some time. That was in the forties, anyhow. jj: Okay, um, back to the movies. Were they, where were they at, were they? lw: We had three, four theaters in Marion. The Indiana theater, and the Paramount theater, the Lyric theater, and the other one was called the Luna Light. pw: Luna Light (in background). jj: Cool! So they were just all around Marion? pw: Most of them right up town. lw: Yeah, right up town. Mmhmm. jj: Let's see, were you involved in any organizations? lw: I belonged to the, uh, Sigma Phi Gamma sorority. jj: And what did they do? lw: Well, it was pretty much a film-thropic organization, and, uh, I guess that's pretty much it. I don't think I belonged to any other organizations that I can remember. pw: I didn't belong to any organizations. jj: Okay (laughing). Did you go to church and were you involved with that? lw: Not during that time I didn't go to church. No. pw: No, I'm, I didn't go to church either. jj: Okay, let's see. Do you remember any important or unusual events that took place in the early forties in Grant County? lw: In Grant County? Well, that was the, in 1941 was the year that Pearl Harbor was bombed, and that was, that changed everything pretty much in Grant County, I think. jj: Okay. What were your feelings that day when you heard all that? lw: Well, with me, I had a brother at Pearl Harbor that was bombed and we didn't hear from him for some time afterward. My mother, who lived in another state, finally heard from him, and, um, it was kind of a, an upset, upsetting time during that time. And then at that time, I guess Phil can tell that, but, uh, they started the, uh, drafting of all the young men. I think eighteen? (pw in background: eighteen.) Eighteen and older. They all had to sign up for the draft, and, uh, some of 'em were drafted but others went ahead and signed up for the, uh, what they chose; and I'll let him tell about that. pw: There was, uh, kind of a weird feeling knowing that you was going to have to go to the service and getting involved in the war, and, um, I didn't want to go in the army so I enlisted and went into the Navy. And, um, I went to Great Lakes Naval Station up north of Chicago where we trained without a uniform. They didn't have uniforms back in those days 'cause they was calling in so many boys at that time that they just didn't have enough uniforms for them. So I took my training in my own civilian clothes. I was there four weeks. Five weeks I was over, went over seas. Yeah, it was scary. lw: At that time I had, I had a boyfriend who enlisted in the Army Air Corps and went to the Army Air Corps to become a pilot. jj: So did, did you eventually, you went to war? pw: Yes, five weeks I went over seas. I was on the, uh, left on the Booker T. Washington in, uh, New York and went on the North Atlantic across to, uh, Belfast, Ireland and we went on down to South Wales, Carthsbury, Swansea, and Belford Haven. We loaded, we unloaded. We carried, um, 500 pound bombs and high octane gas. We unloaded and we loaded back up and went, and went down from, um, England down to North Africa to Casablanca, and, uh, unloaded down there, Casablanca, then come back to the States. I was gone about a year and a half at that time. lw: My boyfriend was Dale Truman and, uh, we were married in February of 1943 and he was killed in July of 1943. He flew a B-24 bomber. So everything around Marion changed at that time. We used to, uh, look at the papers and the first thing we’d look at was for the missing in action or killed in action. That was in the daily papers here. And a lot of things changed. We had during the war we had rationing, gasoline was rationed, sugar was rationed, and, uh, we couldn’t buy things like hose and, um, it was just different. Things were, uh, hard to get at that time. jj: Okay. Did, did the women’s roles change when the war started, when most the men were off? pw: Mmhmm. Uh, course at that time they were taking all the young men, you know, and putting them in service and 'course women was put in the factories then and, uh, did the job that men were doing in factories at that time, and, uh, even around the ship yards and everything they were women welders instead of, instead of men. jj: So they basically took over. pw: Yeah, they basically took over the young people’s jobs and, uh, it was, uh, quite an experience, you know, back in those days, to know that women, you know, were taking your place. lw: They used to have what they called Rosie the Riveter (laughing). lw: That was just a kind of a . . .
lw: Yeah, just something of all the gals working in the factories. pw: We used to wonder though on ship, uh, course they were all welded up in those days, you know, riveted like the Titanic was. That was, that was all riveted together. And, um, the ships during World War II, they were all welded, and 'course, women would weld them and they’d hope they had a good welder on their ship. Get out, get out at sea, you know, and have somebody, you know, misweld it and didn’t know what they were doing and have the ship fall apart on you. Kinda scary. jj: Oh, wow. I’m gonna pause it. Let’s see. Okay, now that we’re back on . . .
lw: I might tell you, Jamie, that when we bought hose, we didn’t have, uh, nylons then like we do now. We had silk hose or rayon, and we used to have to stand in line downtown at the store to get, buy hosiery. jj: Oh, wow. So was that the only type of clothing that was rationed? lw: Pretty much, I think. I don’t, I don’t, uh, 'course we didn’t have a lot of money back then and so, uh, I don’t, I don’t recall anything other than, than that that was hard to get other than that they didn’t have silk, uh, hose and that type thing. pw: Cigarettes, candy, sugar, and things like that were all rationed. Uh, we were even rationed on ship. We could only get so many cigarettes or so much candy and stuff like that. So it had to be limited also. A lot of times when we were, um, out at sea, we were gone maybe for weeks at a time without getting back in port, and, uh, we would have to be careful, you know that how much food we’d use or candy and cigarettes and stuff like that cause you could only carry so much. I used to give my candy and stuff, we had a little twelve-year-old boy at, uh, Clarivel, Sicily. That, uh, that was our home port. And, um, I used to save my candy up and give it to him. He’d take us, he'd take us around different places and show us different things around, around the island and Sicily and take us home with him every once in a while. Talk with his mother; it was nice. jj: Let’s see. How did you cope with being gone so long for that year, year and a half? pw: Well, it wasn’t easy at times although you’d, uh, you’d get homesick and, um, you’d want to see somebody, you know, but things were back, different back in those days. I mean, uh, fellows on the ship that you were with were, uh, that was your family and, and those things. And, uh, we did have, um, the first ship that I was on, I was on the Booker T. Washington cargo ship. They were a real nice bunch of fellows and we got along wonderful, and, uh, the merchant marine was on there, They were all, uh, colored. They were a wonderful bunch of fellows, and, um, before we were on the ship we were called in a certain office and, uh, they explained to us, you know, that we were going on the Booker T. Washington. If we didn’t want to go on it, why, we didn’t have to. They called twenty, I believe it was twenty-one men, and we went in and we had to man the guns on the ship. And, uh, they told us if we didn’t want to go, um, with the colored merchant fellas, why, uh, we didn’t have to. There wasn’t a one turned it down. We all went on. 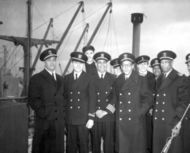 And, uh, had a colored captain, the mates, everything, the whole merchant marine was all colored. The only one there was of the merchant fleet at that time. It was the first one. We had a, had a wonderful time, I mean as far as, you know, getting along together. It was real, real nice. It was rough. jj: Did you write letters and things back home to your mom and your family? pw: Well, yeah, of course. You’d write them and you, you couldn’t send them until you got in port and a lot of times then we would, be out for week, weeks at a time. And then, course they’d censored all your letters and everything and couldn’t (lw in background: they’d mark things out with black) and they’d cut it, they’d cut your letter out. And, uh, you couldn’t tell them where you was at, where you, what you were doing or anything. The only thing you could say is “I’m fine,” and that was about it. You couldn’t even tell where you was at. jj: Wow. So all they knew was that you were alive. pw: Yeah. You’d let them know, you know that everything was fine, you were well and that was about the extent. jj: Wow, I can’t imagine that. Do you have anything else that you want to say about the war? pw: I was on that merchant ship and after I come back, States, uh, I was transferred then over to Amphibious Fleet, and, uh, on down to Galveston, Texas. We picked up a brand new L-CI, that’s landing craft infantry, and, uh, went back overseas on that we were over on the Mediterranean. On up through Sicily and Italy, Isle of Elba, and, uh, Corsica, invasion of Southern France. At that time when we were coming back, why, the war ended so, I got out a short time later. jj: Leah, do you have anything you want to say? lw: Well, after my husband was killed I came back to Marion and my parents moved back to Marion, and, uh, we moved in together then until . . . that was in 1940, the latter part of 1943 I think, and, uh, my parents then lived with me until my mother died in forty-five. And then, uh, it was pretty much just go to work and, uh, I had a rather routine life then. And then the war ended in 1945, and, uh, we gradually, I guess, got back to what you might call half-way normal living. And, uh, then I met Phil in 1949. When I came back I worked at Butler Music Company downtown and I met Phil then in 1947. Right? (pw in background: Yeah.). And we were married in 1949. I guess . . . .
pw: We got out of the service, they didn’t save our jobs for us like they do now-days. We were just, you got out of the service, you were on your own. And, uh, there was, jobs were hard to find, and, uh, I heard that there was an opening on the fire department so I went on the fire department and I was on there for, I think I started my seventh year when I retired. jj: Okay. So after the war was over, when you heard it, what, what feelings were going through your minds and the people around you? Obviously you were happy. pw: Well, there was really a, a happy day. And, uh . . . .
lw: I had mixed reactions--glad to see the war over but I had lost a husband and a brother-in-law in the war and so it was rather difficult time for, uh, in that area. pw: We used to get together after, lot of fellows, you know, that course I knew, went to school with and everything. We’d been gone so much and so long you didn’t know whether they got killed or anything about them, you know. A bunch of us used to get together just about every day, you know, and talk and, and bout where they’d been, what they’d done, you know, in the service, and things like that, you know, for awhile. That's, uh, they, you know, would, would be glad, you know, we were back. We'd go out to walk, out to Grant Memorial Cemetery. They used to have crosses, cement crosses down through that center lane down through there. You'd go out there, and, and there was a cavalry service that had crosses out there. You'd just see cross after cross after cross, you know, of guys that you knew (lw in background: Of fellas that we went to school with, that were killed), and, uh, I had, I lost two real close friends and, uh, I'd run around with, and, uh, I was real close. I lost two of them in service. jj: So, things got back to normal but they weren't near as normal as what you had hoped for. pw: Yeah, yeah. Yeah that's right. lw: Everything was changed pretty much. jj: Were the same values and, um, I guess values of life the same? pw: Um . . .
lw: I think so. If you had the training when you were young I think that those things stay with you. We went on, and, uh, tried to make our life worthwhile, and, uh, started, uh, eventually started back to church and got involved in church, and, uh, things became more normal, I think after we were married perhaps. pw: Yeah, I think, uh, after we were married we got back in church and, uh, and got involved in church then we really thanked the Lord, rejoice in his presence, for the life that we've got, changed an awful lot with before we were married. jj: Let's see. Did women keep the same jobs they had during the war or did they go back to their old jobs or . . .? pw: It was very common. jj: So then, if they were the industrial people what did the men do? lw: That's pretty much when all the men who work in the factories nowadays, uh, it's just a carry over, carry on from then, I think. pw: Yep. That's why you see . . .
lw: However, I worked at the Delta Electric Company when I, uh, was seventeen or eighteen, I think, nineteen till, before I went to the bank, I forgot to tell you that. The Delta Electric Company. jj: What did you do there? lw: Well, actually I had different jobs, but I started out as a an inspector and then I was moved into the office and that was, that was, however, that was before I went to the First National. I forgot to mention that. pw: When I could have had the machines, Tool and Body Shop down First and Boots, and, uh, I was, was living with my grandparents at the time. I got to use the town, and he wanted to know if I wanted to start in tool and die making starting, it was a job, and I started out sweeping floors, Wiley and Lett, when I was sixteen. Uh, that's how I got started in machine work, been ever since. jj: What, I guess, memories do you have of life after the war got done? What other things happened? lw: One of the girls that I lived with, she went to California, and I lived in California then for a year with her, and, uh, she was married, she was married, then I moved back to Marion. I lived, lived here then till I met Phil and we were married. jj: Did any other special things that happened? pw: Do you need more than that? lw: I'm sorry, Jamie, I didn't hear what you said. jj: That's fine. Was there anything special that happened around here to you? pw: No, uh . . . .
lw: Other than that we were married. We had a daughter. lw: Yeah. And, uh, 'course a lot of things in Marion have changed over the years from what it was back then. jj: Let's see. You were telling me about Five Points and the Soldiers' Home . . .
lw: Oh, yeah. Well the By-pass, there was no By-pass there. That was pretty much, like the end of Fourth Street hit, there was a farm out on the corner of, uh, what is now Western and 38th Street, there was a big farm out there. And, uh, um, as we went north, there was, there wasn't too much there but a country road. However, I wanted to tell you one thing, and that there was out on Western Avenue way back then there was a school and it was just black children. lw: I can't tell you the name of it. It was on the, uh, on the east side of the Western Avenue and it was a just like a, well you might think it was a great huge two bedroom school, but it was, it was an all black school at that time. And, uh, there just wasn't much else out along that way until I don't remember when the By-pass was built. It was a number of years later and there wasn't anything at, uh, out at Five Points, out where the mall is and, uh, and, uh, out in that part there was a big farm there on the corner. pw: Where Raven's Funeral Home is that used to be Spark's Dairy Farm, and where the funeral home is right now their home was sitting right there. pw: And they had a big dairy farm. Course it was a big barn there and, uh, Bob and Paul, the two boys, they’re still around town. jj: So, was Marion mostly, mostly made of farms? Or was there . . .? pw: Around, yes it had farmland all the way around it. Mmhmm. I can remember when my mother was the night supervisor at the hospital, um, it was a nursing home right in back of the hospital that, uh, nurses could stay in. And she lived in the nursing home, 'bout every Sunday Granddad would bring us in to see Mother. And, uh, her room faced the west, and at that time Jeffras Avenue and Euclid was all farmland. There was a dairy farm, that was all dairy farm there at that time. And that’s about it. lw: Then later on, I think they put a golf course. pw: Later they put a golf course, there was a golf course in there. And of course it changed when they built houses in there. jj: Wow. You said that McCulloch used to be an elementary school also. lw: Mmhmm. McCulloch? From kindergarten through the, uh, ninth grade. At that time junior high was eighth, ninth, and tenth, and, uh, I went there from the fourth grade through the eighth. And then I, my parents, uh, my dad pastored a church in Jonesboro for a year and then we moved back to Marion and I went to Marion High School, and he pastored at Nelson Street Wesleyan Church while I was in high school. And then at that time I went to Marion College for a year. But that, that was pretty hard times back there and we couldn’t just go to college very easily. But they only had, uh, four buildings. There was the Administration Building, and Teter Hall, and a gymnasium, and a boys’ dorm, which was a big old brick home. That was all that was at the college at that time. jj: So the boys stayed on campus but the, but the girls didn’t? lw: No, uh, the girls stayed in Teter. lw: . . .in Marion too. I thought that’d be interesting. jj: So did they, the streetcars, did they run . . .? jj: Was it like the bus system? lw: Sort of like that. Um, the tracks ran down the middle of the streets like, oh, from . . .
pw: Railroad, they had wires on, up overhead there that they, electric (lw in background: Yeah, yeah. ), run from. lw: They had a streetcar that, for instance, that came out here to the Soldiers’ Home and, and then it would go back, go to Marion, or back downtown and I think it went out to West Point then, uh (pw in background: Yeah), out to, uh, (pw in background: Bucktown), Bucktown, we called it Bucktown at that time. That was out Ninth Street, and the streetcar ran out there, and then there would be a car from, a streetcar’d go from the college and then you’d go down and go around the Square and out to North Marion on the same car. Or if you were going to a different part of town then you’d have to get a transfer and changed. I think, at first I think, uh, we paid a nickel maybe to ride the streetcars and then I think it went to a dime. We thought that was pretty expensive. But, uh, we rode the streetcars all the time back then. 'Course back during the war we didn’t have cars, lot, uh, lot of us didn’t have cars and, uh, streetcars were pretty handy. They ran pretty much on time. Let’s see. Down around the, 'course I think I told you there was, there was no By-pass, no stores, no malls, stores out there. All the stores were around the Square downtown, and the, 'course people went downtown to do all their shopping. And, uh, I thought one interesting thing was, there was Western Union, we, back that time, we sent telegrams; we just didn’t pick up the phone, uh, uh, drop of a hat, you know. We had to, we sent telegrams. And then there was one called the Postal Telegram. It was downtown also. pw: You seen, uh . . . .
pw: Where the cafeteria, Marion Cafeteria is now, you know where they’re building it up? pw: Did you see on the side of that Bob Wilson’s? pw: I remember when that was, uh, uh . . . .
pw: Cafeteria and then used to be a kind of a market in there where’d you go in there and buy fresh vegetables and stuff like that and things, opened up a restaurant. lw: Barney’s Market and then it was owned by Carl Barney and he was, uh, he was may- mayor of Marion, the man that had the, uh, grocery and cafeteria in there. Another thing I thought, uh, the, uh, streetcar went clear out to the park and we used to have a swimming pool out at Matter Park. And, uh, and then there was a swimming pool out at Idyl Wyld Skating Rink also, so that was, of course, a lot of the recreation in the summer time was, going, going swimming. Oh, let's see. pw: I went to Fremont Number Nine School. And my teacher in the sixth, seventh, and eighth grade was, uh, Bernard Carmen. We called him Uncle Bernie. And, uh, I went from there eighth grade right into high school. And, uh, later on my, uh, Bernard, uh, went to the high school and was teaching there. lw: And the high school was up on Nelson Street I think we told you that, didn’t we? jj: Yeah, where Hilltop is? jj: Okay, where the VA is now, that used to be the Soldiers’ Home? lw: And it had pretty much World War I veterans, veterans. pw: Back in those days, after World War II. lw: Was kind of a sad place to go in that time. You’d go back and all those, well, they had big screened in porches, I don’t know if they do now, but those soldiers would be out there and it was kind of a sad place to go. Then on Sunday afternoons they’d have a band concert. I don’t know if the bandstand’s still out there or not, I suppose it still is. pw: Probably, I don’t, I don’t know. jj: I think so. Bands, like, I don’t know, when I think of band I think of high school band. Is that . . .? pw: Oh, a lot of times they would have different, uh, individuals, you know, around town would have their own individual band, you know, and stuff and they’d go out and just get a group together and play a lot of times. It’d vary from the marching bands to, uh, well the jazz band, stuff like that, a lot of different variety. We used to go out there and play ball the summertime, then in the wintertime we’d go to the gym and play basketball for ‘em, and, uh, lot of the patients would just love for you to come out, you know, and entertain them, you know, playing ball and stuff like that. They enjoyed that. lw: During, I think I told you, during the war, um, a lot the, uh, girls, 'course there weren’t many fellows around here but the girls used to, uh, go out the VA and, and entertain and have, they had dances out there and, and, uh, for the entertainment for the soldiers. pw: I think one thing, uh, especially in the, just in the last few years, is the nursing homes that have built up. Um, Emily Flynn, I think was about the only one around town for a long time, and, uh, there was no place for older people that really got sick, uh, no place for them to go. And they’d have to stay home. But, uh, just been the last few years that they’ve built up a lot of nursing homes around town. I remember back when my mother, um, went, took her nurse’s training, the hospital was on, um, Seventeenth or Eighteenth and Washington. pw: Eighteenth. It’s torn down now, burned, but, uh, that’s where Marion General Hospital used to be years and years ago. Yep. jj: So, that’s not the only building that’s changed, is there . . .? pw: Oh, no. There’s so much that’s happened downtown, uh, uh, the way of buildings and the like. When I was on the fire department we used to have a two story building, where the central station is now it used to be a wooden structure. And, uh, 'course you’d work twenty-four on, twenty-four off in those days and, uh, you’d have to stay there overnight and, uh, had our beds upstairs and had a brass pole that, uh, you had a call at night you could slide down this brass pole, second story down. And, uh, all the old fire trucks back in those days, uh, the only thing they had was a windshield on them and that’s all. You drove from the right-hand side. Great big wheels on them and we had to really fight them on down the, down the street cause the streetcar tracks were right in the center, and, uh, no power steering or anything. It was, it was tough driving. lw: Back, uh, back then, Washington Street from, from, uh, downtown, clear out to the college used to be a beautiful street. Had beautiful homes, great huge beautiful trees, and it was (pw in background: So was Adams Street). Yeah, Adams Street was too, well as far as that goes they all were (pw in background: Yeah. ), no, except Washington Street had big, big beautiful homes on it and, uh, the other streets were, were nice, well kept streets. Um . . . .
pw: YMCA, that used to be down on Fifth Street. They built a new one down Third Street. lw: It was the corner of Fifth and Boots. jj: Did that offer the same kind of stuff that it does now? Like the recreational activities? pw: Well, yeah, about the same thing. lw: I worked in the YMCA on Third Street for fourteen years; did the bookkeeping for them. pw: When they took the streetcar, did away with the streetcars and got buses in, 'course they had tracks all over town. I helped take those tracks up. jj: Oh, neat. That would have been hard. pw: Yeah. I worked out the streetcar barn and then, uh, that was the last job we ever did, was taking the streetcar tracks up. Took the tracks up and dug the old tile out of the streets. lw: We used to have a, at Marion High School, we used to have thing every Easter called the Easter Parade. I don’t know when they stopped that (pw in background: I don’t know either.). I was in Marion High School when they started it. I think the first year was 1933, I believe. We used to, uh, the whole school would vote on an Easter queen, and, uh, then, we had a big Easter, uh, parade at the Coliseum downtown. That was quite an event in Marion High School then. pw: Marion High School used to play all their basketball games at, uh, Coliseum, years ago. lw: I remember when the Coliseum was built. lw: I can’t tell you. I can’t tell you when, was, well we lived in Marion at that time. pw: I have a picture. We used to go to, go to the Coliseum, uh, when I was on the fire department for training, and they put a ladder up the side the Coliseum clear to the roof. You’d have to carry a ladder up that ladder on your shoulder, put it on the roof. I have a picture of myself carrying that ladder up there. lw: Have a picture of him in one of the big fire trucks too. pw: Bring that to, uh . . . . Course they, you couldn’t get fire trucks or any equipment, you know, during the war, and they’d just have to build up and build up and build up, you know, the old fire trucks. They bought, uh, an eighty-five foot aerial truck and uh, a new pumper for downtown when I was down there, and I have pictures of, um, the old trucks and the new ones. pw: Wiley and Lett used to be right where the I & M is now. It used, it was where I started my machine shop work, right where the I & M is. Wiley and Lett used to have that. From Boots to Washington Street in there. pw: Let's see. 'Course all the car dealers were on Second Street, most of them, between Boots and Nebraska Street. At least part of them. 'Course Hollingsworth had the, uh, Hudson and Studebaker place on South Washington Street. And the rest, of course Howard’s, they built a place on Seventh Street there. That’s a busy place. jj: You were talking about the Easter Parade at the high school. jj: Were there any other celebrations that, that happened at the high school or in Marion? Did you go to the park for fireworks like we do now? lw: Didn’t go to the park I don’t think except to swim. pw: They didn’t have fireworks, you know, city-wide, you know, like they do now (lw in background: Uh, well when did they start the fireworks? I don’t know when they started them.). lw: But the Coliseum was pretty much basketball games and, um, and then the Easter Pageant, Easter Parade every year. We had a, an, an Easter queen and a, uh, a princess and a court, I think, and then, uh, had a big program that featured the, the Easter queen and the whole thing was beautiful. One time, I remember, the decorations in the, you’ve been in the Coliseum, they had, they had a great big swing from clear the top of the Coliseum and, uh, with flowers up and down, fastened on each side and the, the Easter queen and the, her boyfriend sat in that big swing, and that was part of the program, that was fun. jj: Is there anything else? pw: Doctor Merrill Davis’s wife, she’s the one that started the Easter Pageant years ago. lw: Mmhmm. I went to the very first Easter pageant at the Coliseum. jj: Wow, was it exactly the same or have there been a lot of changes? pw: Oh, it has grown and their costumes and everything . . .
lw: They’ve added a lot to it. pw: It’s enormous nowadays what it used to be. 'Course they started out, you know, just on a shoe string. Just getting started, it was real small. lw: It was good, though, and they had, had large, large crowds that came to the Easter Pageant. pw: It was good. She’s the one that started it years ago. pw: Can't think of . . . . Well the factories have all, grown in the last few years. Uh, used to be the RCA that, that seemed like every year they’d add some more on to that. Foster-Forbes is the same way, and, uh, General Motors, tremendous asset to the city of Marion when they come in. And, uh, all of, lot of your factories was, uh, just growing around town, uh, they were real small at one time. lw: I think, this is my own personal opinion, but when Fisher-Body came to Marion, that really changed the, uh, I’d say homey, maybe family atmosphere that we had in Marion at the time because there were so many strange people came here and it was just different. Don’t you think? pw: Yeah. 'Course it helped, helped the economy in Marion a great deal and, uh, as far as wages go, you know, other factories in town, a lot of them would working, working wages at that time was, oh, a little better than minimum wage. But it really boosted the city of Marion and their economy a great deal. jj: So when the factories came in it brought new people. pw: A lot of new people, yes. jj: Did . . .
jj: Did the farmers and like the dairy farmers, did they, were they still part of, a big part of Marion or did they . . .? pw: Oh yeah, they were still part of Marion. lw: When I started work at the Delta Electric I made twenty-six cents an hour, which wasn’t all that much at that time. jj: Well . . . .
lw: When the streetcars, when they took the streetcars away from Marion then they put the city bus, buses in. I don’t remember just exactly when that was, but it was quite a change for Marion not to have the, the streetcars. pw: Marion General Hospital too has changed, oh, a great deal in, in years. Uh, especially in the last, oh, thirty years, I’d say. It has just grown to where it’s just, just couldn’t imagine what it was like when I was a kid. Just, a little three, had three floors, and, and, uh, that was about it. They’ve just added to and added to and, and tremendous asset to the city of Marion to have all the doctors around town that we have. pw: Used to, uh, there at the, uh, dam, the old mill, they, we used to, uh, bring our wheat and grain in there and they’d grind it for us. When I was a, when I was a kid the dam there used to be wooden. Used to be a wooden dam in there and 'course they didn’t have the flood gate or anything in there at that time. But, uh, but they built a cement dam in there and later on, I think later on they put the, uh, floodgate in there. lw: One of the amazing things I think is how the downtown area of Marion has changed since back in the forties and fifties. It’s just, uh, it used to be the center and the hub of things and now it’s, uh, not quite that way. jj: Right. So, it had all the shopping and the . . .
lw: Yeah, all the shopping. pw: Everybody’d go to town on Saturday nights. lw: Oh, used to be that way . . . .
pw: Yeah, go up . . . .
lw: That was the big thing on Saturday night was to go to town and walk around the Square. lw: Get a nickel Coke. They had a place on the corner of, uh, Fourth and Washington Street, and it was called the New York Candy Kitchen. And they had delicious ice cream and candy in there, but we’d go in there and buy a, get a Coke. And then there was a, a drug store that was called Groom’s, it was called Groom’s, it was Groom’s Drug Store. It was on the south side of the Square and all the kids gathered there, high school kids. That was a, a gathering point back then for kids when they were drinking Coke. pw: Spencer Hotel would be up there, on the, uh, southeast corner of the Square. It was this, this, this building I don’t know what the, City Building? City Building they’re remodeling right now. lw: Back then there were two main hotels: the Spencer Hotel and then on, uh, Fifth Street between Washington and Boots there was the Marion Hotel. But it’s been gone for quite a, quite a number of years. pw: It's been gone for a long, long time. jj: Were there a lot of visitors to Marion? lw: I, I imagine pretty normal. I don’t know whether there were a lot. Uh, college, of course, at that time was so much smaller. They didn’t have the visitors to Marion College like they do, have at IWU. I don’t, I don’t know anything else. jj: When you went to college at Marion College, what, what classes did you take? lw: Uh, I took, uh, English. I took my, I was going to have my major in music so I took History and Appreciation of, uh, Music, Ciphering, Sightsinging, and, uh, I took Evangelistic Piano Playing, and, uh, French, and, uh, (pw in background: Recess! ), recess, gym, uh, Bible, I had Bible--New Testament. I think that’s pretty much what I took. And then when, uh, when I got through that one year that’s when I got a job at the Delta Electric and went to work. Oh, I might tell you that I worked for one of the teachers at Marion College. lw: Uh huh. Uh, Francis Stafford who was the art teacher. I used to clean her house for fifty cents an hour. They helped pay my tuition. I had a small scholarship but it didn’t amount to that much. jj: Okay, that’s fine. It’s been a good interview. Thank you. I think we’re gonna stop if you’re through. Thank you so much. lw: Okay, I hope that wasn’t too rambling . . . . Gas City High School, Upland High School, and, uh (pw in background: Van Buren. ), Van Buren High School and Swayzee High School and Sweetser High School. lw: Let’s see, we didn’t have any of those consolidated schools, and, uh, they all used to come to Marion for the basketball tournaments at the Coliseum. pw: Sectional play. All them little schools would always come in here and play, and it was a lot of fun back in those days, you know, and some of em were, uh, 'course they'd come over, you know, come to beat Marion and, uh, came and, uh, they would once in a while too. Oh, Swayzee and Marion played to how many overtimes one year? lw: Oh, I don't know, a whole bunch. pw: Six or seven. Something like that, and, uh, that coach, he still lives out here on Western Avenue, Charles Sidle, Sidle. jj: So these schools, were they the main rivals then around the area? pw and lw: Oh, yeah. lw: Big rivals, big rivals. The county schools were. Mmhmm. pw: Especially Gas City. Gas City used to have, uh, some real good teams over there. In fact they went to Semi-State one year when they were just Gas City. pw: Yeah. They had a big team at that time, back in, uh, I remember in high school if you had a guy, say, six three or six four, you know, you had a big fellow there. And they had two or three six five boys on their team. And they were good. Jack Colescott was one of them. He played on the team. Yeah. And, uh, they were real, they were real good basketball team. lw: Well, Jamie, I hope that helped you a little bit. jj: It did. Thank you. This page was last modified on 29 June 2007, at 06:06. Content is available under Noncommercial-Sharealike 3.0 unless otherwise noted.